Crowley is now providing valuable LNG services to a wide variety of industrial customers throughout the U.S., Caribbean, Central America and Alaska. 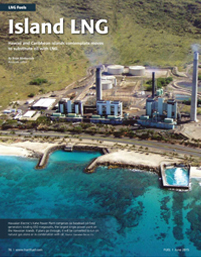 In Alaska and the Caribbean, through the company’s petroleum distribution division and subsidiary Carib Energy, respectively, Crowley offers a comprehensive and diverse suite of LNG services including small-scale containerized transportation and delivery; bulk transportation and delivery; vessel design and construction; engineering; consulting and project management. Customers have come to rely on Crowley because of its proven success in the marine, project management, energy, and transportation fields. Now customers in these regions can turn to Crowley for a wide variety of affordable and efficient LNG solutions.